Whenever you plan a camel safari, you will have to get used to about the only thing, it's nothing but the balancing act and getting use to the movement of the camel. This animal with long-neck may look aloof, but it's known as the lifeline for the desert people. Being the major mode of transport in the desert, camel is also known as the 'Ship of the Desert'. Adventure trip in Thar desert will be an unforgettable experience for you as beside the blurry, savage and extreme image of the desert, it offers the adventure of exploring the sandy landscape and passing through the interiors of the state. And just imagine the thrill of camping on small pond sites or spending the night under the stars and jive on the tunes of the musicians. As the climate is usually extreme in the deserts, afternoons may seem much hotter than actual 26-30 degree temperature may suggest. The temperature in night may drop even below freezing point in the dunes. Therefore you are advised to stock both woolen and cotton clothing here. Although shorts and skirts are considered very comfortable to wear during camel safaris but visitors should keep it mind while passing through the villages that villagers are very sensitive to skimpy dresses, specifically in the case of ladies. Cotton caps (that can be dipped in water when it gets too hot) and sun hats with large rims, a balaclava or scarf to cover the neck and forehead. You can buy umbrellas in Jodhpur as these are considered quite convenient for camel safaris. Moisturizers and sunscreen cream also should not be missed. You can slung a water bottle on the camel saddle or carry tangerines. It may not be practical even on a deluxe safari to dismount each time to drink from the carted water supply. You can avail bottled mineral water in Jodhpur and Jaisalmer. 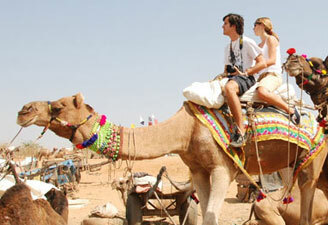 You should find out whether the baggage is being transferred by camel cart or vehicle. A small handbag can carry the essentials that you may need on the way, in case of the latter. If you are prone to sickness, you can carry suitable medication against the swaying gait of the camel. One torch, penknife or even the cutlery will be required. And last but not the least, patience is an important piece of baggage while on a camel safari. It takes time to get to grip with camel travel and to reach the destinations that may be on your travel priorities. Along with riding the camel, there are some other facts also that you shouldn't forget while touring the desert regions of Thar. If you have booked a camel safari trip in Thar in advance, it's better to check them before leaving for your desert safari trip. As the mercury soars here in the desert, you should carry the sufficient backup of potable water to avoid dehydration. Your clothes should also provide enough breathing space to your skin, as the chances of sweating are quite high for you. You should prefer loose fitted cotton clothes and wear shoes to avoid exposing your skin that may cause sun burn. The local Rajasthani turban named as Sola-Topee or some kind of head protection is also essential.